Scales for shop and supermarkets use with high performance color display 7". Fitted with printer / labeller with the rewinder printing and high speed printing. The new design ensures completely freedom on the weighing surface, facilitating the work of those who use it. Scales for shop and supermarkets use with high performance color display 7". Fitted with printer with the rewinder printing and high speed printing. The new design ensures completely freedom on the weighing surface, facilitating the work of those who use it. Scales for shop and supermarkets use with high performance color display 7". Fitted with printer / labeller with the rewinder printing and high speed printing. Hanging label maker scales with stainless steel design, ideal for the fish markets and where water and salt make the work environment particularly aggressive. Displays 7" color allows to valorize at best of his own products and shop. Self Service Scales for supermarkets use with high performance color display 7". Fitted with printer / labeller with the rewinder printing and high speed printing. The new design ensures completely freedom on the weighing surface, facilitating the work of those who use it. 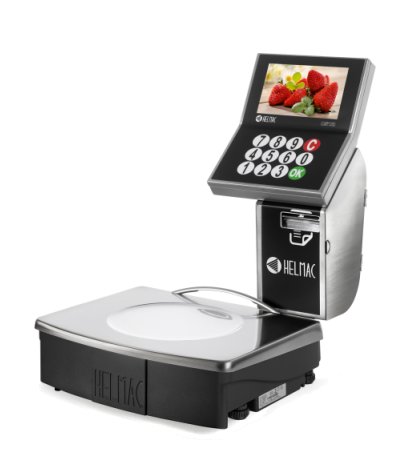 Scale is equipped with a high resolution thermal printer and a built-in peel-off mechanism for adhesive labels, a large-sized stainless steel plate, and a wide range of selectable functions. Price computing, counter scales, with stainless steel structure and waterproof membrane keyboard. Suitable for labelling of prepackaged goods. Scale suitable for all the labelling applications. Thanks to the external high-performance labeller, it allows you to print labels even with big size, with traceability data, EAN128, GS1 barcode and 2 total labels.